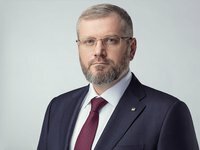 Presidential candidate Oleksandr Vilkul, deputy head of the Opposition Bloc faction in parliament, has put up UAH 115,000 bail for policeman Vasyl Melnyk who was arrested by court on February 12 on suspicion of beating members of the nationalist organization C14 near the Podilsky police department in Kyiv last Saturday, February 9. "The policeman was doing his duty. Under extreme conditions. When the militants attacked the Podilsky district police department. I have posted bail because I want to build a lawful state in which everyone has the right to protection, regardless of the political situation for the country's leaders," Vilkul wrote on his Facebook page on Wednesday. As earlier reported, on February 12, Kyiv's Pechersk District Court chose a preventive measure in the form of detention with an alternative of paying a UAH 115,000 bail for police officer Vasyl Melnyk, who is suspected of beating a member of C14 nationalist organization laying on the ground during clashes near the Podilsky police department building in Kyiv on February 9. On February 9, 2019, the police detained a group of young men wearing disguises on Kontraktova Square in Kyiv some time before a rally of one of presidential candidates was to start there. They were taken to the nearest police station. Later, their allies arrived at the police station and attempted to free their comrades. Clashes between the young men and the police followed. The police used batons and sprayed tear gas.